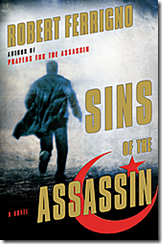 ANSWERS Book Reviews » Blog Archive » -"Sins of the Assassin"
This is the second book in Robert Ferrigno’s fast paced ‘Assassin Trilogy’. 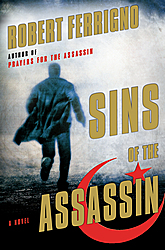 The first book: "Prayers for the Assassin" set a precedent that is hard to equal, yet "Sins of the Assassin" is a worthy successor that stands up well on its own. Again the setting is circa 2043, The northern part of the former USA is now an ‘Islamic Republic’ with the capital in Seattle. The old South is a loose confederation called the ‘Bible Belt’. The Mormons have their own country in Utah and Southern Idaho with parts of Colorado; while Nevada is a ‘Free State’ all its own. America has become a ‘third-rate’ power that even Mexico (now- ‘Aztlan Empire) is picking on; and native Americans have claimed part of Wisconsin and Minnesota as their own. How far the mighty have fallen! The current story revolves around a warlord/hero Colonel in the Bible Belt who is searching for a super-secret weapon hidden by agents of the old USA regime which could change the entire balance of power in America. Former ‘Shadow Warrior’ Rakkim Epps is sent by the ‘Islamic’ president and his wife Sarah (who is a counselor to the president) to spy on the Colonel and possibly steal or destroy the weapon. Rakkim is saddled with Leo, a techno genius but a real life klutz. A match that is sure to slow him down but proves to be beneficial in the end. Meanwhile, the ‘old one’, who Rakkim and Sarah exposed in the last episode, is pulling strings in the background hoping to finally establish his international Caliphate. He surprisingly has a secret player in the colonel’s camp with an eye towards stealing the weapon for his own purposes and power. At the same time, he is allied with the ‘Black Robe’ Islamic radicals who seek to kill the president and have also added Sarah to their list. The book is full of non-stop action and intrigue. There is even some interesting religious ‘miracles’ to consider and Rakkim seems to be ‘haunted’ in some way by the ‘Assassin’ he killed in the first book. Meanwhile, Sarah is secretly working on a plan with allies in the Bible Belt to reunite the whole country as it use to be. In the end, our heroes have survived even if the president hasn’t. At least He has been replaced by another ‘moderate’ or so we are lead to believe. There is some indication that all may not be as it seems. It will be interesting to see how this plays out in the final book. 1 Response to -"Sins of the Assassin"